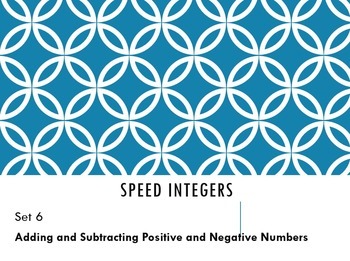 Building students' integer computations skills is key to algebraic thinking. 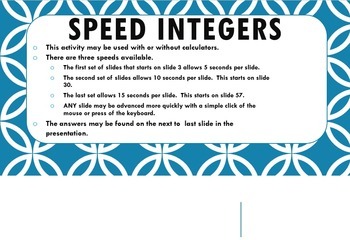 Speed Integers presentations are a versatile way to practice or assess learning in this area. This particular presentation contains expressions requiring only addition and subtraction of positive and negative integers to simplify. There are 25 problems, each on an individual slide. 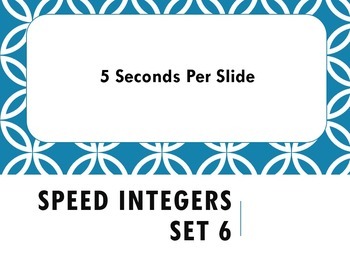 * The first set of slides moves at 5 seconds per slide. * The second set moves at 10 seconds per slide. * The third set moves at 15 seconds per slide. At any time the next slide can be advanced clicking the mouse or pressing a key on the keyboard. 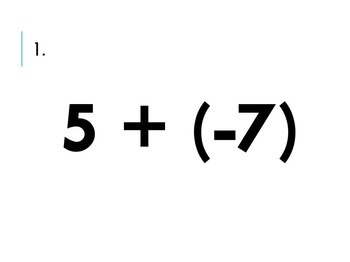 See the next-to-last slide for answer key.